Concrete countertops offer a completely customizable, handcrafted surface popular in kitchens, bathrooms and outdoor entertaining areas, as well as in restaurants and bars. Concrete counters marry functionality and beauty, giving you the ability to create surfaces in virtually any color, shape or size. Textures and finishes are available to match any design style, including traditional, modern, contemporary, industrial, and rustic, plus they are inherently durable and easy to clean and maintain. Concrete Countertop Cost How much do concrete countertops cost? Find out standard costs and what design factors contribute to the price. Countertop Design Ideas Get a behind-the-scenes look at concrete countertops that have been installed across the country in homes and businesses. Concrete Sinks & Vessels Learn all about concrete sinks and discover the limitless design options of shape and color. Concrete Style Guides Download these design sheets for concrete countertop ideas in modern, old-world, or traditional design schemes. Countertop Mixes & Supplies Contractors: Learn about countertop mixes, molds and more and find suppliers and stores near you. 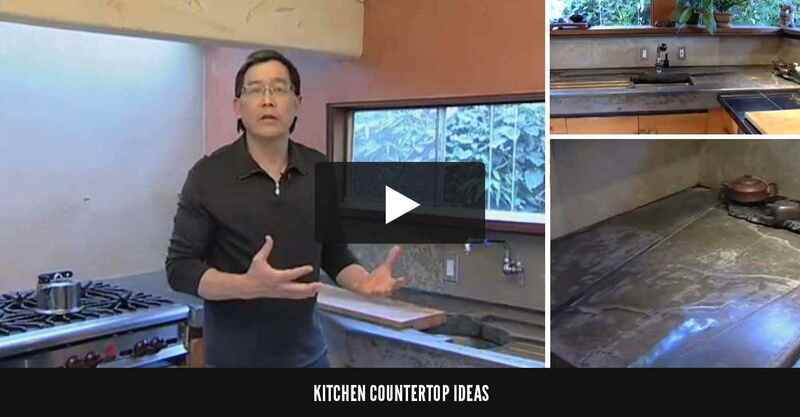 Countertop Design Videos Watch 16 videos with expert design ideas for using concrete countertops in residential and commercial settings. WHERE ARE CONCRETE COUNTERTOPS USED? Dark gray concrete was used to create the countertop for the island in this industrial kitchen. Concrete provides more customization options than traditional surfaces like granite, marble, tile, or laminate for kitchen countertops. The unlimited color choices, varying finishes, and the possibility to integrate items such as drainboards and trivets give concrete countertops the clear advantage. The ability to create larger areas without seams that trap crumbs, grease and grime is another point in their favor. Concrete is naturally durable and easy to maintain. Kitchen countertops can be cast to accommodate sinks, faucets, cooktops, or other kitchen appliances. If you are new to concrete, a good place to start is with a bathroom countertop. The smaller surface area, and not being located in a main living area, will give you a chance to experiment before committing to a larger project. Incorporate an integral sink for a truly custom look. Concrete is an excellent choice for outdoor kitchen and entertainment area countertops due to its natural weather resistance, often withstanding the elements better than granite or tile. Shape, texture, color and style can all be customized to support your personal style and entertaining needs. The customization that is possible with concrete countertops makes it a perfect choice for restaurant bar tops or reception desks. Business logos and color themes can be designed right into the surface. Durability and ease of maintenance add to the growing popularity for commercial use. Countertops are either precast in the contractor’s shop or poured in place. Precasting allows the contractor to control the conditions during the entire process and gives easy access to any tools or equipment needed along the way. If delivery from the workshop or getting a larger piece into the finished space is a problem, pouring in place is an option. Pouring countertops in place can be messy, as well as disruptive in your home. From start to finish, the process may take a few weeks, depending on the finish. Discuss the entire process and timeframe with your contractor to determine the best choice for your project. Making a concrete countertop yourself is a complex job, better suited for skilled do-it-yourselfers with some concrete experience. 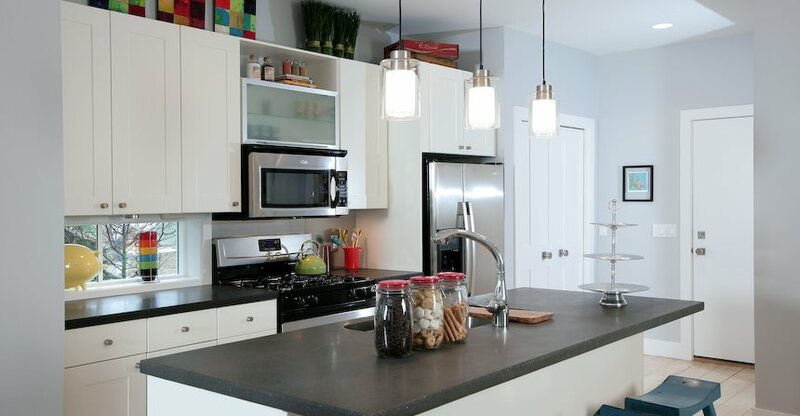 Find out more about DIY concrete countertops. Installing an overlay can be a little more DIY-friendly, as well as less expensive. Overlays can be applied to existing surfaces such as laminate, tile, marble, or unfinished wood frames with minimal preparation. They are considerably lighter weight than poured countertops and can be made seamless for long runs—something that might not be possible with either precast or even poured-in-place countertops. Design elements such as color choices, finishes, stamping, stenciling and aggregates can still be applied with overlays. Complete kits are available. Many contractors are using GFRC mixes to make countertops that are lighter weight, but still strong and durable. These mixes are reinforced internally, eliminating the need for additional support. Because of this enhanced strength, GFRC countertops can be poured thinner, making them lighter. For consumers concerned with sustainability, these mixes also offer a more environmentally friendly option because they use less cement and often use significant quantities of recycled materials. Looking for a cure for the common kitchen counter or a sleek, clean design for the bathroom? Craving a unique outdoor entertainment area or a customized bar top or reception desk to show off your logo? A concrete countertop may be the answer. With complete customization of color, finish, size, shape, edge details and more, you can truly make your concrete countertop a one-of-a-kind focal point. No other material offers the same level of customization. This countertop looks more like a piece of art than concrete. Since concrete is molded, it can be formed into virtually any size or shape. While white and black are the top requests, the color choices are truly endless. Powdered or liquid pigments are available in an array of colors from neutral to vibrant. Experienced contractors can create custom colors or even color match to paint or fabric swatches. Various methods used to impart color include using an integral color in the mix, surface staining or dyes. Handcrafted textural effects such as woodgrain or stone looks can be cast onto the surface of the countertop directly from a mold, and other textures can be fashioned from skilled hand-troweling techniques. Veining and mottling effects can be created with specialized concrete mixes and casting methods to make your countertop mimic high-end granite or marble. Varying degrees of grinding or polishing can result in a final finish that ranges from matte to shiny smooth. Further polishing exposes the aggregate within the mix, whether the naturally occurring stone or a decorative aggregate that has been added, such as bits of recycled glass or tile, decorative stone, seashells, etc. Smooth-polished surfaces are easy to clean because they don’t trap dirt, grease or grime. 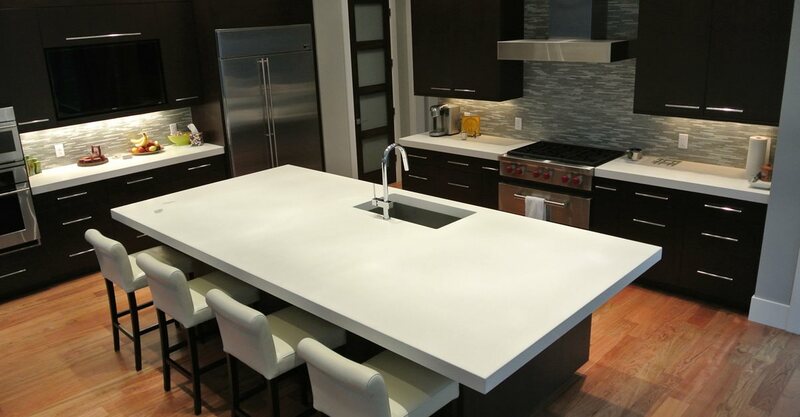 Another way to customize your countertop and give it a high-end finished look is with edge designs. The look of stone, rope, vines, and more can be created with prefab molds. Some contractors can also make custom edge molds to fit your specific design. Add style and function to your kitchen or bar countertop by incorporating a drainboard or trivet. Drainboards allow water to run off directly into the sink. They can be simple slats or depressions formed directly into the countertop. Trivets help protect your countertop’s sealer and finish from hot pots and pans and are typically made from stainless steel raised metal rods embedded into the countertop. However, the design possibilities for trivets are limitless as long the material used can withstand the heat and use. 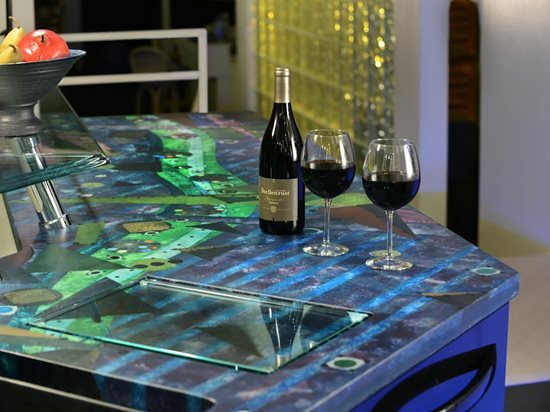 Here’s where you can really customize your countertop and add some personal flair. Inlays are larger items placed into the surface of the countertop, such as rocks, shells, wood, coins, large tiles or tile mosaics. Personalize your countertop with a monogram or logo for a truly one-of-a kind project. Small decorative pieces (also called aggregates) such as stones, pieces of glass, bits of marble or tile, seashells or other materials can be embedded throughout the concrete mix and exposed when the countertop is ground and polished. They can also be seeded into the surface after the countertop is poured to create a shape or design or for a more concentrated appearance. Consider long-term durability and consult your contractor regarding any items you’d like to add. See more ways you can personalize your countertop. Bring your countertop to life at night by incorporating fiber-optic lighting in your design. Light fibers attached to pieces of clear or colored glass embedded in the surface of the countertop create a unique lighting effect. Most countertops, whether kitchen, bath, bar, or outdoor will incorporate some type of sink. Sinks that are molded as a continuous part of the countertop are called integral sinks and offer numerous design possibilities—waves, ramps, troughs and more. This type of construction is better suited as a bathroom sink rather than a primary kitchen sink due to wear and tear from pots and pans and possible staining that can happen in the kitchen. When using manufactured sinks in the kitchen, undermount styles are typically the best match for concrete countertops. Backsplashes can be cast in the same color and style as the countertop to create a cohesive design, or use a contrasting color, design, or shape to provide an accent. A traditional tile backsplash can also be installed with your countertop. Find more ideas for your project in The Concrete Network's concrete countertop photo gallery, so you'll know just what you want when you're ready to hire a contractor. Concrete countertops are generally no more expensive than granite or marble. The difference is that the majority of the cost doesn’t come from the materials used, but lies in the artisan’s creativity and design skill, as well as the transportation and installation of the finished product. On the affordable end, concrete countertops can cost around $65 per square foot. For a more creative design, the cost can rise to $135 per square foot or more. Factors that play a role in the final cost of your countertop are the shape, size, thickness, color and finish of your countertop, as well as additions such as edge designs, backsplashes, inlays, or decorative aggregates. Limiting customization and using more recycled materials can help keep your budget in check. 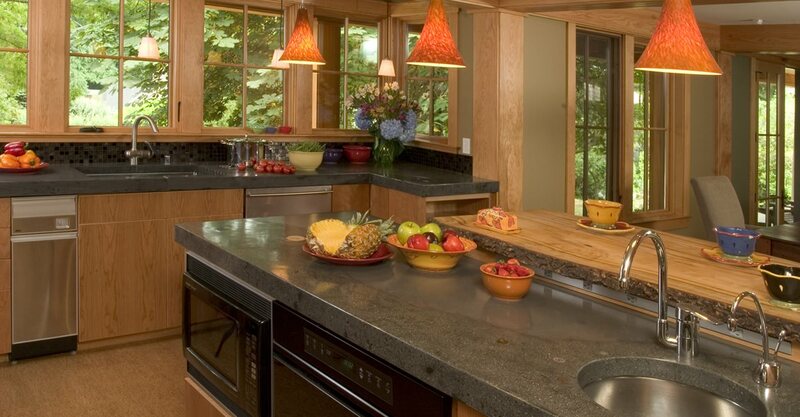 One often overlooked element is the long-term value that concrete countertops offer. A timeless design plus the inherent durability of concrete can equal decades of functionality. Down the road, this can save you money, time and the hassle of replacing outdated or worn out countertops. Due to the naturally porous surface of concrete, all concrete countertops should have a sealer applied to prevent water and stain absorption. There are food-grade sealers designed especially for food-prep areas such as indoor or outdoor kitchens or bar tops. Sealers are vulnerable to heat damage from hot pots and pans, so trivets or other forms of heat protection should be used. How do I clean and maintain concrete countertops? As long as your concrete countertop is properly sealed, it should be as easy to clean as a laminated countertop surface. As a general rule, use a pH-neutral cleaner and avoid the use of aggressive scrubbing pads or abrasive cleansers that can wear away the sealer. 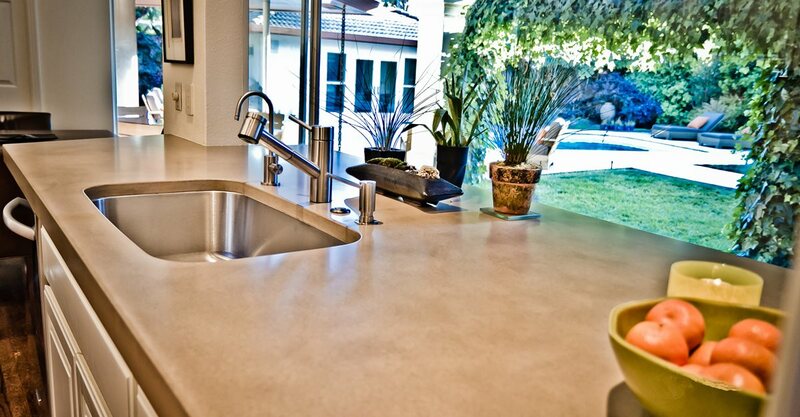 Learn more: Cleaning Concrete Countertops, Tubs & Sinks. If your countertops do become stained, you can often remove the stains yourself using the right materials and methods. See these concrete countertop stain removal tips. Minor scratches can occur from cutting directly on the surface, but such damage is generally limited to within the sealer and not the concrete itself, making this an easy repair. See Touching Up Minor Surface Scratches. Will my concrete countertop crack? Minor cracks can develop from natural shrinkage, but they are usually not structural in nature and often add to the natural appearance of the countertop. Using various reinforcement methods during construction can help to prevent this. Learn more about concrete countertops and cracks. HOW LONG WILL CONCRETE COUNTERTOPS LAST? Concrete countertops will serve you well for decades — both functionally and aesthetically — and are unlikely to ever need replacement. Under normal use, your concrete countertop will often last the life of your home. This not only conserves materials and eliminates waste, it saves you the expense and hassle of ripping out worn, outdated countertops. HOW DO I HIRE THE RIGHT CONTRACTOR? When choosing any contractor, get several written estimates and check references carefully. It's especially important to see a portfolio of their work and provide actual samples of the colors and finishes they offer. Visit their website to find photos and descriptions of their prior work. Get more tips on how to hire a contractor for interior concrete work. Find a local countertop contractor.